INTERVIEW | Kacey Ainsworth, Holes at Nottingham Playhouse. Louis Sachar's novel Holes is a story I know well from my days at school having studied as part of my English GCSE. The novel went on to being a big screen smash-hit in 2003 starring Shia LaBeouf. Now 15 years later the story is now a new theatrical version being performed at Nottingham Playhouse until Sat 22 April. Holes follows Stanley Yelnats, as he is sent to a labour camp as a punishment for a crime he didn't commit. He was born into a family cursed with bad luck so it comes as no surprise to him that this is just another bad luck experience. At the labour camp he is given the task of digging one hole. five foot wide by five foot deep, every day. He is told it's to build 'character'. It's clear that the Warden has something to hide. The story goes on to follow Stanley and his fellow inmates as they deal with her demands, her two cronies and plus the fearsome rattlesnakes and yellow-spotted lizards! This new production will include live music, scary puppets and breath-taking scenery. This adventure will be perfect for adults and children aged 8 and up to enjoy. Kacey Ainsworth who plays the Warden became a household name in 2000 when she joined Eastenders as 'Little Mo'. This role won her recognition as 'Most Popular Actress' in the 2002 National Television Awards so it's a delight to see her taking on a theatre role. 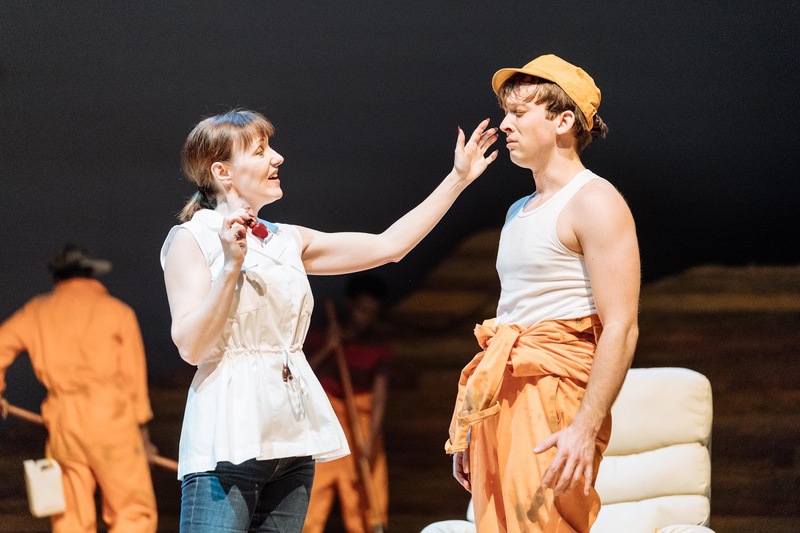 We caught up with Kacey to find out a bit more about this new production at Nottingham Playhouse and more about her role. 1. What is Holes about? Holes is about a boy called Stanley who gets sent to Camp Green Lake, a juvenile correction centre based in Texas. It's a complex but extremely entertaining story of Stanley's adventures - like all good shows it has a very strong story which has twists and turns and surprises.. it will not end how you think! 2. What drew you to the role of the Warden? She doesn't cry once and I get to be rather sassy. I also play a Latvian fortune teller so both parts are a good challenge for me in terms of accent and tone. I was also influenced by the fact that my daughter read the book in year seven and loved it so much, plus I'd met Adam Penford before and wanted to work with him too. 3. Have you been to Nottingham before? I came to Nottingham to do Calendar Girls and was shown around by my touring stalwarts in the company. 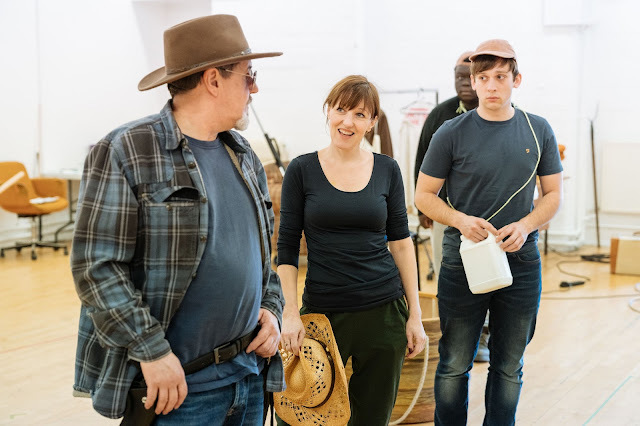 We've also got some Nottingham actors in Holes so I've got more tour guides, which will be fun! I came to the Playhouse recently to watch Wonderland, which was fabulous and I absolutely love the space and how the stage is hugged by the audience, it’s gorgeous. 4. You're very well-known for your role as Little Mo. What was it like to play a character with such a turbulent life? The schedule on the soap can be crushing but I loved her and people still call me Mo in the street. It's lovely to have created a character who people not only identified with but also took to their hearts. 5. Do you miss the show? I miss doing it every day and working on something where you know everyone from the crew to the tea lady. A series for ITV that I’ve been embargoed from telling you the name of... sorry! You can see Kacey Ainsworth and the rest of the fantastic cast of Holes at Nottingham Playhouse until Sunday 22 April 2018. You can book your tickets by visiting the Nottingham Playhouse website. *pre-written interview. Provided by Cartwright Communications to use on the blog.